Recently I stayed at a hotel that had a lounge with an air hockey table in it. After a few games, I was reminded just how much fun these things are and that maybe I need to rethink my list of things for the perfect home game room. Air hockey is one of those things that I always make sure that I play whenever I am at Dave & Buster’s. I’m a competitive air hockey player and nothing gets my adrenaline pumping like the “clink” that you hear when you sink that little air hockey puck into the slot on the opponent’s side of the table. That got me to thinking that I definitely need to make a space at home for one of these so that I get can my air hockey game on whenever I want. 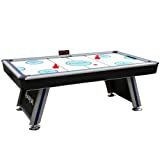 If you are having the same thoughts, then let me share some of the top air hockey tables that I have managed to find while doing my own comparison shopping. our ratings are based on value, durability, ease of assembly, and size. **This page contains some affiliate links and GamingWeekender may be compensated if you make a purchase after clicking on the links. 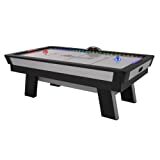 Before you head over to Amazon or another online or local store to check out the selection of air hockey table, first familiarize yourself with this game room equipment so you know what you’re looking for. This way, you will know that you are buying a good air hockey table for the money and not just a cheap piece of crap table that won’t even make it to see next month without breaking. Cause let’s face it – some of us get a little aggressive when hitting the puck with our striker, so we need a quality table to prevent any damage. If you have ever played air hockey in a rec room or at an arcade (like Dave & Buster’s), then you have played on one of the regular stand alone tables. In my opinion, this is really the best type of air hockey table that money can buy. However, it does require a lot of space in your home, which isn’t always possible for people. So, if you live in a small apartment, condo or have other space challenges in your home, then a table top air hockey table might be a better choice for you. With one of these, you can sit it on a dining room table or another game table, like a ping pong table, and then store it in a closet or under a bed when it’s not in use. 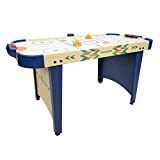 Often, a table top air hockey game is the best air hockey table for kids since it not only has a cheaper price than a stand alone table, but because it is easily be stowed away. How much space do you need for an air hockey table? Well, the general rule of thumb is to allow for a few feet of extra space at each end for the players to move around. So, if you have a full-size air hockey table, then you’ll need a room with at least a 10-foot by 7-foot area of open space. Multi-game tables often convert to foosball, ping pong and/or billiards – all in this one little table. The benefit of getting a multi-game table that includes air hockey is that you only need space for one full-size gaming table and you get several games in one. The bad thing about these, in my opinion, is that they are never the highest quality, which is really unfortunate. As you compare the various models on the market, you’ll notice that there are two different types of scoring methods – electronic and manual slider. The cheap air hockey tables tend to have the sliding scorers, which looks a lot like an abacus. With these, you just slide the scoring bead to keep track of your points. The more high end air hockey tables come with electronic score boards that keep track of your score. This is what you see in arcades and places like Dave & Buster’s. Does it have a fan or blower? If you’ve played air hockey in an arcade, then you’re probably used to the hum of a motor that sort of suspends the pucks on the table and actually moves them a little bit without you touching them. Unfortunately, not all tables include this feature! The cheaper models do not have a fan or blower, which means that you have to actually move the puck yourself. Of course, then benefit here is that you get a quiet air hockey table since there is no motor whirring all the time. But for the best game play, we definitely recommend spending a bit more to get a model that has a blower or fan. So, if you have a table that has an electronic scoreboard or a blower/fan, that means that it needs a power source. For some models, this will mean batteries and for others it means that you need an electrical outlet nearby. We prefer the models that require an electrical outlet because air hockey tables use up a lot of batteries fast, which can get expensive. Plus, you’d hate to run out of batteries in the middle of a game and have no spare ones on hand! This wouldn’t be a problem with a model that plugs into an electrical outlet. Does it have leg levelers? The nicer models all have leg levelers built-into the design and you should definitely choose a model that has this feature. Why? Because it works to ensure that your table is completely level, even if it is sitting on an uneven surface. Sure, you might think that your floor at home is level, but what if it is not? That’s why you need leg levelers to ensure that a fair game is always being played on a level playing surface. If you’re interested in the professional quality USAA-sanctioned home model tables that the pros use, then you need a large puck air hockey table. These are generally more expensive, have good air flow, and are designed for heavy duty playing and regular use. 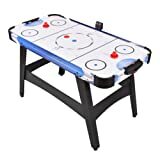 The small puck air hockey tables tend to be cheaper and have weaker air flow. 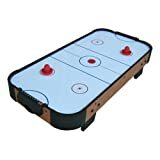 This is actually the most common type of home air hockey table for kids and occasional players, but do know that the smaller pucks are more lightweight, which means it is easy to accidentally fly them right off the table. For this reason, we only recommend small puck air hockey tables for kids age 10 and under. How much does an air hockey table cost? Cost is another factor to consider when comparing the top air hockey table brands and models. Maybe you need the best cheap air hockey table under $200 or maybe you just want the best value air hockey table for the money. You can easily spend less than $100 on a good table top air hockey game. And the really nice, high end luxury air hockey tables can cost over $1000. How much you spend really just depends on your budget and what you’re looking for. When I am shopping for something like this, I definitely want to get a good value for the money without sacrificing quality. With that in mind, I want to share my top picks with you in case you need a little help narrowing down your choices. 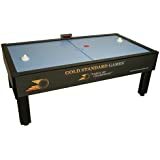 Since a lot of parents look for a table top game for their children, I kept that mind when comparing all the top rated air hockey table top game sets. 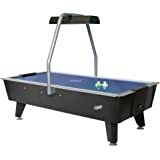 Based on my research, I’ve decided that the Playcraft Sport 40-Inch Table Top Air Hockey is my top pick. It’s great for adults without a lot of space at home, as well as the best air hockey table top version for kids. Plus, it is a cheap air hockey table and our review rating is good and with high quality. CE certified and ul approved motor. What I really like about this one is that it has a good size at 40-inches. And, it comes with 2 pucks, 2 strikers and an air-powered motor. It really almost gives you that “at the arcade” feel. What I don’t like about it is that it’s made from MDF. Sure, that is a sturdy build but I prefer something a bit more high quality that this. That being said – if I was on a tight budget and needed something for a small space, then this would definitely be my pick. Bottom line: it’s easy to put together, it can stand up to aggressive players, it’s a good choice for kids, great for limited space and it’s very cheap. But, if you want something a little nicer and don’t mind a higher price, then check out the Carrom 42-in Power Play Hockey Game. Carrom is one of the best air hockey table brands and this model doesn’t disappoint, to me. If you have the space for a stand alone air hockey table, but don’t want to spend a lot of money then you’re in luck. There are actually a few different models that are to be found in the lower price range that are great for smaller spaces or for teens and kids. 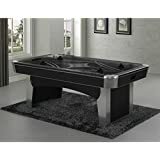 Of those, my favorite model is the Harvil 4 Foot Air Hockey Table, which we found when looking for the best cheap air hockey table under $200 – $500. UPGRADED FEATURES - A more stable electronic scorer that ensures uninterrupted fun. Wider goals for easy puck retrieval without any worry of hurting your hands. Faster fan speed for more exciting game plays. Enjoy your air hockey tournaments with family, friends or loved ones. COMPACT DESIGN - Just the right size hockey table. It is space saving and fits most size rooms, while the playfield is spacious that you dont compromise the fun. Game table dimensions (goals excluded): 48 L x 24 W x 31 H inches; Playing surface dimensions: 47 L x 23 W inches / Weight: 28 pounds. STABLE, RELIABLE AND COMES WITH ACCESSORIES - This adult air hockey table stands on thick, L-shaped legs with leg levelers. The electronic scoring unit operates on 2 AAA batteries (batteries not included) and can withstand even the most intense matches. Air hockey table comes with 2 sets of orange, 75mm paddles and 60mm pucks for free, so you can start a friendly match right after easy setup. MANUFACTURER WARRANTY - Your table will arrive with all the necessary parts, without defect and/or shipping damage. Well ship new replacement parts or an entirely new table at no cost in the event of defect or damage. If you still arent satisfied, youll get a full refund. We also offer in-home delivery and assembly for an added fee. In the 90-day warranty period, we will repair or replace defective parts at no cost to the purchaser. I do wish that the table was a bit larger in size, but for the price it’s still a great deal. Also note that it’s made out of MDF instead of solid wood. The playing surface is laminated and the pucks slide over it easily with the electric blower motor. This table also has an electronic scoring unit, but it’s not the best. In fact, if sometimes keeps score poorly. So, do know that before you buy this one. Fortunately, it also has manual score keeps for you to use. This is probably a good choice for kids since it is a smaller sized table and has such a great low price. Of course, adults can use it too if you don’t mind the smaller playing surface compared to some of the larger stand alone tables. It is easy to put together and seems sturdy enough for the money and can stand up to aggressive playing. It’s not the best table out there, but at this price point it is an awesome deal. If you really want to recreate that arcade feel, then getting one of the larger 7-foot tables is the way to go. I think that the best value table at this size is the Brunswick 7ft Air Hockey Table – Windchill, we found this model when looking for the best 7-foot air hockey table for the money. 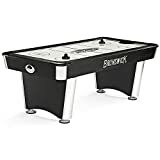 SLEEK and CONTEMPORARY DESIGN - The Brunswick 7-inch Air Hockey Table boasts of a sleek and contemporary styling for an asthetic appeal.Approximate Dimensions: 83.75 x 41.75 x 30 inches/ Approximate Weight: 149 pounds. CONSTANT FLOW UL BLOWER - Strong UL blower keeps every game exciting and in motion. No dead spots! STURDY PEDESTAL BASE - The game table is supported by sturdy pedestal base that keeps the entire table level. DUAL ABACUS SCORERS AND COMPLETE ACCESSORIES - Each side of the air hockey table features an abacus scorer and it also comes with 2 mallets and 4 Pucks. 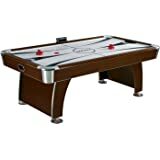 With this air hockey table, you get high quality materials and a great looking table all at an affordable low price. If you have a hard time finding this one in any local stores, then I suggest trying to find a place offering it with free shipping to keep your costs down. There are a few other brands with similar models but at lower and higher prices, but the high quality is why I prefer this one. It also has some great features. It comes with an abacus style score keeping system. And the rails have an overhang that helps prevent the puck from bouncing. If you’re an aggressive player, then you know what I’m talking about. The electric blower is heavy duty, which is perfect for a fast-paced game. This table actually comes with four pucks and two mallets (or paddles), which is than normal. And I love how sleek the design looks! It’s laminate over MDF. My only real complaint is that it’s made of MDF instead of solid wood. Despite this, it is still a very heavy table at around 150 pounds. So, you’ll probably need at least one other person to help you move it around you home. If you take your air hockey, and your home rec room, seriously, then nothing but a professional quality air hockey table will do for your home. Unfortunately, a lot of these models are well over $2000! 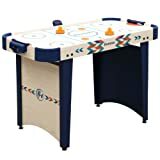 I can’t honestly recommend spending that much though when there is a more affordable option out there – the Carrom 325.30 Signature Professional 7-Feet Air Powered Hockey Table. This high quality air hockey table looks great and plays even better. Sure, it doesn’t have all the luxury styling of the more expensive models. But I think that this is a great deal on a professional air hockey table the under $2000 price range. One of the best things about this table is the brand – Carrom has a great reputation for making high quality game tables at affordable prices. Plus, it just looks sleek and not cheap at all. It will make a great center piece in a home game room. The electric motor is high powered, which results in some seriously fast game play – perfect for even the most aggressive players. Getting it all setup and put together is incredibly easy. And you will love that this table includes drink holders on the side. Sure, the drink holders don’t make it the classiest table around, but this way you don’t have to worry about one of your boys putting a cup on the side of the table and then spilling it on the table top. This furniture grade construction air hockey table comes with two pucks and two strikers. It’s not really intended for kids under age 13 since it is a high quality game table. One thing to know about this table is that it is VERY heavy at over 250 pounds. So, be sure that you have a few people around to help you move it on the day that it arrives. As you might imagine, there are a lot of other models of air hockey tables out there that you can purchase. Plenty of them cost more than these tables and there’s also quite a few that are cheaper. That being said, I think that these models offer you the best bang for your buck and I strongly urge you to consider them when shopping for a new air hockey table. You can click on any of the links above to get more information about the tables that I have reviewed, as well as learn about other air hockey tables that might be of interest to you. Don’t drink or eat at the table. Food crumbs or liquids can block or clog the air holes, which hinders the performance of the fan. the damage can get so bad that the puck no longer floats on the table! Don’t sit drinks on the table because they can sweat or spill on the surface. Not only can this stain the table, but the liquids can run into the air holds and damage how the fan makes the pucks float. Regularly dust the surface of the table with a vacuum to remove dirt and dust buildup from the air holes. Always do this before wiping down with a cloth – and don’t forget to vacuum the corners of the table! A damp cloth can be used to wipe clean the surface of the table after you have vacuumed up any dust that might be clogging the air holes. Never use a waxy cleaner on the table surface cause the wax can build up and clog the air holes. If you have to use a cleaner, then use a glass cleaner, and spray it on the cloth instead of directly onto the table surface. Pucks and mallets (paddles) can also be cleaned with a damp cloth to prevent dirt build up. For stubborn build up, you can use a glass cleaner only, never a wax-based cleaner. When not in use, keep the table covered to prevent dust build up – and never store anything on the table top! By following these tips, you should be able to get plenty of years out of your new air hockey table.